Free Piano Lessons for Free Spirits! Free Piano Lessons for Beginners, Intermediate and Advanced Players! Welcome! We're glad you decided to join us and follow our free piano lessons and hear what we have to say about the piano world in the net and beyond. We have great piano lessons for fresh starters and for those who want to improve their piano playing. Some like to imitate what they see on a video but you can learn how to form all possible amazing piano chords and learn to play an enormous amount of different styles like Pop, Rock, Blues, Jazz and more while playing popular songs by artists like the Beatles, Adele, Bruno Mars, Leonard Cohen and more. Check out our complete "Piano by chords" course where you'll go through a journey that combines both piano lessons and piano tutorials the will make play the piano like a PRO! 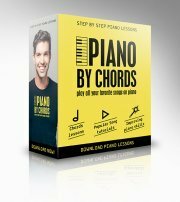 Click here to check out the Piano by Chords Learning Kit Now! View our Piano Tutorials for other exciting piano tutorials in all different genres. We Also offer a big variety of Free Piano Sheets in all different styles and for all levels so don't miss that out! starting from step one. Check out our Complete Beginners Piano Lesson Course and see for yourself...be ready to reveal some of the best products existing on the net! Make sure you also visit our Piano Sheet Music Page. We're famous for our handy Popular Piano Sheet Music for example. Enjoy. Have FUN. Spend time with your piano. Remember, The Journey is the Destination!